Antonieta Arceo, Chief of ISD at the ATI Central Office, during the priorities and presentation guide for 2019. 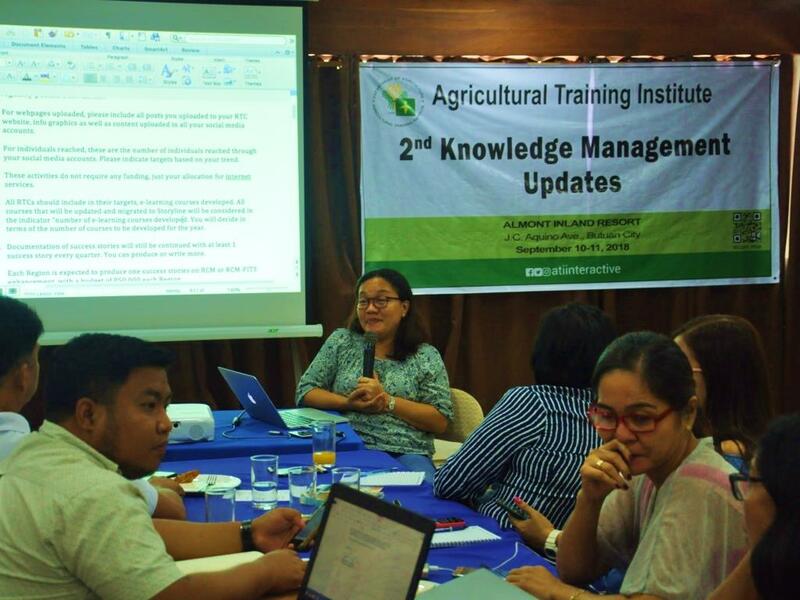 BUTUAN CITY - Fifty Information Officers, Media Production Specialists and staff of the Information Services Section/Division (ISS/ISD) of the Agricultural Training Institute (ATI) gathered at the Almont Inland Resort, Butuan City from September 10-12, 2018 for the 2nd Knowledge Management Updates. Samuel L. Calonzo, OIC Center Director of ATI-Caraga, welcomed the participants during the opening program. He looked forward for the participants’ comfortable stay in the region even amid the humid and prolonged dry spell in Caraga region. Discussions during the two-day gathering composed of information services-related updates, knowledge sharing, planning workshop and presentation of outputs. Staff from the ISD of ATI-Central Office presented the following updates and semestral accomplishments which was consolidated nationally and segregated per region. The eLearning and Rice Crop Manager was presented by Joeven Calasagsag; Techno Gabay Program by Erika Vizcarra; and Web Analytics, Knowledge Products & Media Promotions by Karl Louise Salibio. Representatives from Fintq and Smart Communications were also present to explain the Kasama Ka program. This is a digital financial services where members, like farmers, can avail of loans, insurance, investment, savings, payments, lay-away and other products. Members can earn extra income for every financial services referral they make. Interested individuals may access their website at www.kasamaka.com or through text message via Smart by typing KKK and send to 29292. Antonieta Arceo, Chief of ISD, explained that the reason why Fintq and Smart Communications were invited in order for ISS personnel to be well-informed about programs that farmers can avail of. “We provide all information to our farmers and then we let them decide. What we offer are solutions to them,” Arceo explained. Arceo further presented the priorities and planning guide for 2019 which became the basis of RTCs in identifying their activities for next year.